Home > Sierra Entertainment, Inc.
Found one file extension association related to The Beast Within: A Gabriel Knight Mystery and 1 file format developed specifically for use with The Beast Within: A Gabriel Knight Mystery. The Beast Within: A Gabriel Knight Mystery, also known as Gabriel Knight 2 or GK2, is an interactive movie point-and-click adventure game, developed and released by Sierra in 1995. 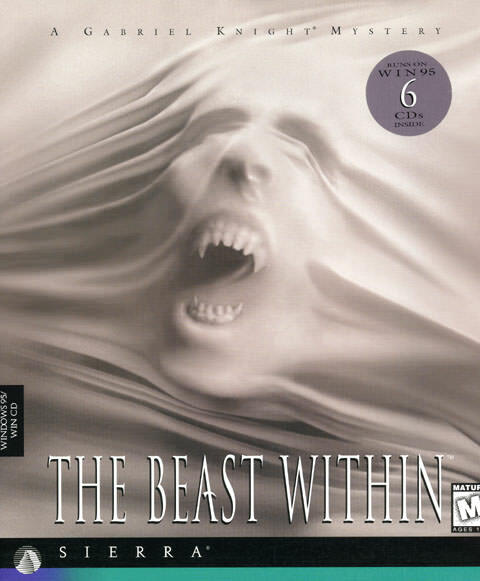 The Beast Within is a direct sequel to Gabriel Knight: Sins of the Fathers, the first in the supernatural mystery adventure series telling the story of a bookstore owner and writer Gabriel Knight, the last offspring of generations of Schattenjaegers (shadowhunters), whose task is to fight the evil forces that abound in the world. After leaving New Orleans, Gabriel moves to the Ritter Castle in Bavaria, Germany, his family heritage. One day, a group of peasants approach the castle, and the elder tells you about a terrible death of a little girl, who was killed by a vicious wolf. Suspecting the wolf could be a supernatural creature, the peasant asks you, the Schattenjaeger, to purge the evil. The investigation brings Gabriel and his assistant Grace Nakimura to the mysterious Hunter Society and to Bavaria's dark past. The Beast Within utilizes a cast of live actors and full-motion video technology: the actors are filmed over photorealistic images of Munich and its surroundings, and nearly every interaction with the environment leads to a FMV sequence. However, unlike most interactive movies that were popular in this era, The Beast Within is a full-fledged adventure game, with a lot of dialogues, detective work to do, and puzzles to solve. Unlike the first game, it is entirely controlled through point-and-click actions. All the icons have been replaced by a single cursor. If you need more information please contact the developers of The Beast Within: A Gabriel Knight Mystery (Sierra Entertainment, Inc.), or check out their product website.